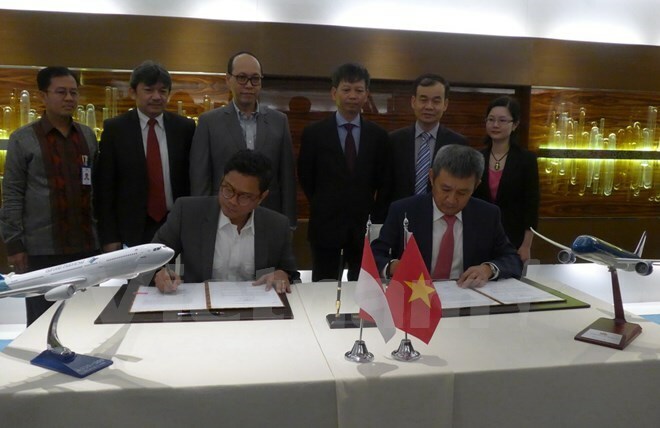 Jakarta (VNA) - Vietnam’s national flag carrier Vietnam Airlines and its Indonesian counterpart Garuda Indonesia signed a memorandum of understanding (MoU) on cooperation expansion on August 23 in Indonesia’s capital city of Jakarta. The event was held on the sidelines of the official visit to Indonesia of Vietnam’s Party General Secretary Nguyen Phu Trong at the invitation of Indonesian President Joko Widodo. The document mentions codeshare flights, service supplies, technology maintenance and goods transport. The MoU will elevate the partnership of the two airlines in a mutually beneficial manner, said Duong Tri Thanh, Director General of Vietnam Airlines, adding that the two sides have maintained good relations since 2006. Pahala Mansury, Director General of Garuda Indonesia affirmed that Vietnam is a key market for Indonesia, adding that the deal will contribute to boosting tourism and trade between the two countries. Vietnam Airlines and Garuda Indonesia are members of SkyTeam – a global airline alliance with 20 members operating some 16,609 daily flights to 177 countries. Vietnam’s national flag carrier currently operates 90 routes with more than 400 flights daily to 20 domestic and 29 international destinations. Meanwhile, its Indonesian counterpart flies to 85 destinations across the world with more than 600 daily flights.